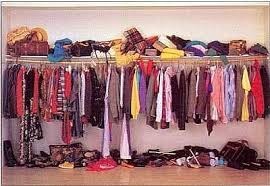 , Inspiration Fashion Folder: Cleaning out your Closet- "The Great Purge"
For some weird odd reason I love to read "cleaning out your closet" guides. I can't explain why, but every time I see a headline about "cleaning out your closet", I have to read it. Most of the time, having no real intention of actually doing it. Don't get me wrong, through the years I've definitely gotten rid of things, ( I threw two Clothing Swap Parties, one of which I mentioned here), but until recently I had never really purged. A recent move and a smaller closet recently forced me to purge and in no way was it easy. I already knew I had a lot of clothes and shoes, but I never thought that letting go of them would be so hard. The following are things I learned from what I like to call "the great purge". While some of the things I'm about to mention seem obvious, keep in mind that it is different when it is YOUR stuff! 1. If you still have T-shirts from high school and graduated over 3+ years ago, get rid of them. 2. If you still have "going out" shirts (you know the shirts you wore when you went out) from college and you aren't currently still in college, get rid of them. 3. If you have shoes that you forgot you have and realized you forgot about them because they are uncomfortable, get rid of them. 4. If you have pants from when you were a different size (either bigger or smaller), get rid of them. 5. If you have "back up" clothes (the ugly ratty stuff that you only wear when no one is around), get rid of it all. **Clarification - This is not your favorite ratty T-shirt. This is the stuff that lives in your dresser, but you actually never wear. 6. If you have anything that is worn out, faded, stained or too short, get rid of it. 7. If you have a dress that you loved and wore all the time, only to come to the realization that almost every single picture taken of you in the last year has you wearing that same dress, then get rid of it. - Thanks social media! 8. If you have anything that any one gave you that you are just keeping to "be nice", get rid of it. They don't remember giving it to you. **Note: If it is a treasure, this does not apply (i.e. : your great grandma's pearls). 9. If you got something for free and think you should hold on to it because you haven't gotten to wear it yet, get rid of it! "Haven't gotten to wear it" being the clue that you probably won't.... ever. 10. If you have anything that you are "saving" to wear and it won't be within the next few months, then you should probably get rid of it. Some people have the capability to just get rid of things and purge on the regular. I have a friend who is always purging because she finds it fun, but that is not me. It actually took a few trials, over the course of a few days before I felt like I had really made a dent. 1. I sold some things to a local consignment shop - made enough to buy a new pair of shoes! 2. I gave to friends- awesome, because they scored some cute new stuff for free! 3. I donated to charity - giving to those in need feels really good. The only things I actually threw away were a couple of shirts that had holes in them or were stained (not sure why I hadn't noticed it before). I would advise against throwing things away. It may take a little longer to get rid of, but it made me feel better to know that what was once my favorite shirt/dress/pants/shoes will now be someone else's. Overall, as much as I put off cleaning out my closet, it was actually eye opening to see how much I have held onto over the years. In the moment it may be hard to let go of things, but when you do you'll find that you don't even miss it. Plus you've got to get rid of the old to make room for the new! Dream closet complete with chandelier!